As the weather continues to chill my bones, and the dual monsters of winter heating costs and the recent purchase of holiday gifts lightens my wallet, I am reminded that this is the perfect time of year to stretch the food budget with a batch of hamburger soup. With the cost of just about every food you can buy climbing at an alarming rate, it’s nice to know you can still whip up a big pot of soup for little more than an Alexander Hamilton (that’s $10, for those who slept through civics class or who aren’t from the US). 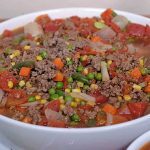 Hamburger soup is a great way to feed a family on the cheap, without cutting corners when it comes to flavor or nutrition. This soup is low in fat and chock full of vegetables, so it’s healthy. But it’s tasty and hearty enough to warm you right up on a cold day. In addition to being a cold and expensive time of year, we’re usually very tight on time at the holidays, and this can leave you feeling a little drained. This soup has the added advantage of being fairly quick and easy to prepare. Sure, you can simmer it all day long to blend the flavors even more, but it can also be prepared in not much more than 30 minutes in a pinch – just make sure you brown the meat prior to adding it to the stock pot. For something a little different, try serving this soup up in individual bread bowls. This hearty and inexpensive soup is the ideal winter food to make once and eat for several days in a row. 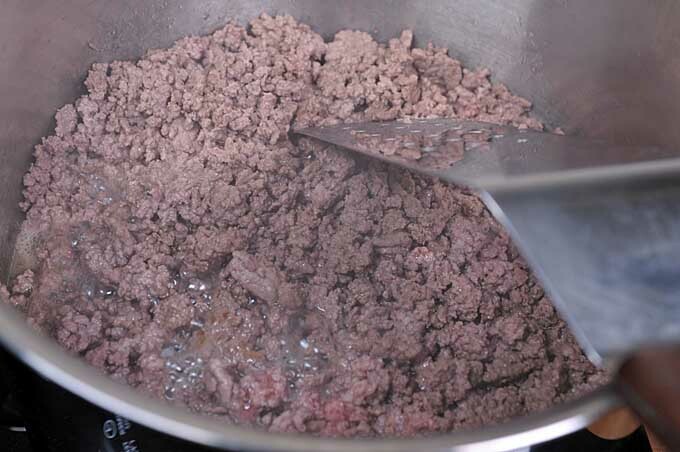 In a large soup pot, add the ground beef and cook over medium-high heat until the meat is browned, stirring often. Add the onions and cook over medium heat until they are translucent. 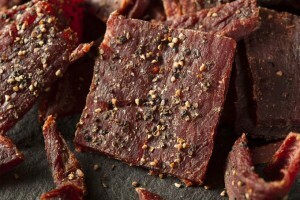 If you're using 80% lean ground beef or less, you may want to drain the fat. 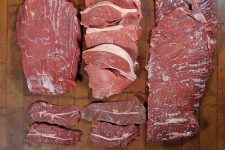 If you're using 85% lean or higher beef, you should be fine. 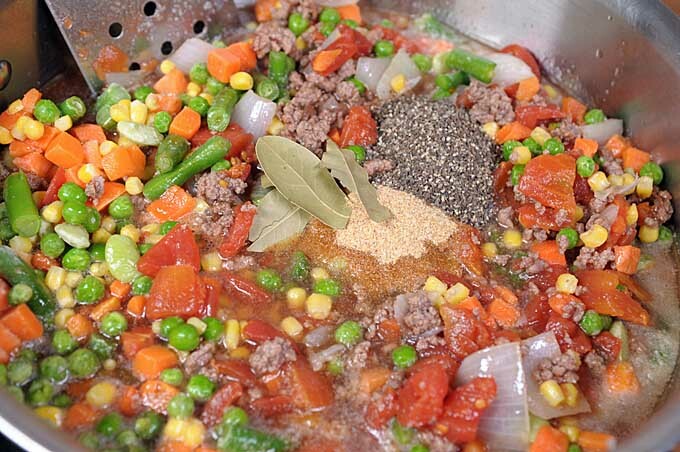 Add the crushed tomatoes, beef stock, garlic powder, bay leaves, and frozen vegetables to the pot. Stir, then season with salt and pepper to taste. Bring soup to a boil and then reduce heat. Simmer soup until vegetables are tender. 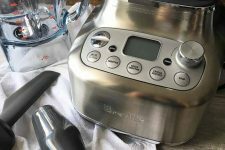 If you have the time, let simmer for at least a 20 minutes, as the additional simmering will only help the flavors in the soup to blend. Remove the bay leaves. Serve hot with a side salad and/or fresh bread. 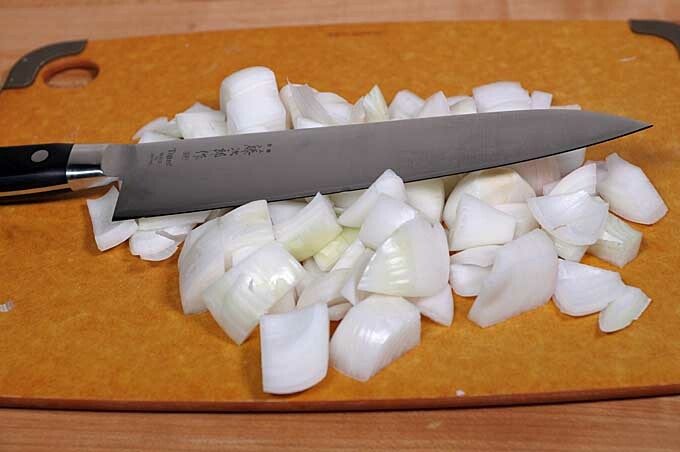 Using a cutting board, chop up your onion with a sharp chef’s knife. I’m using a Gyuto made by Torijo for chopping. 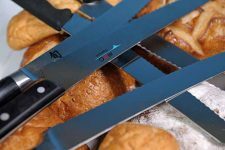 A Gyuto is a type of Japanese kitchen knife. 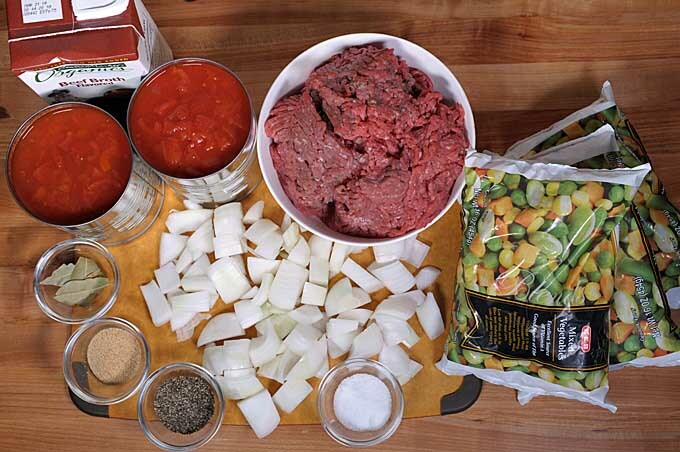 Gather all of your ingredients together and establish your mise en place. 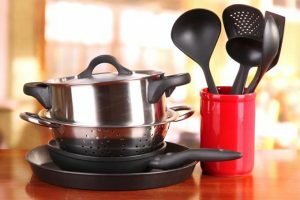 Using a good thick-bottomed stockpot (either tri-ply or one with a thick disc bottom) or a porcelain enameled cast iron dutch oven, brown your hamburger over medium-high heat. I’m using an All-Clad made stockpot for this recipe. I love this brand for having US made products at various price levels – but every line is high quality. I prefer to use a 90% blend of meat to fat in my burger. Why? Anything leaner would require adding extra oil to keep the protein from sticking, and anything with more fat requires draining the oil from from the browned meat. I find that 90% is in the goldilocks zone of enough fat not to be too dry, but not too much where you have to break out the colander to drain excess grease. 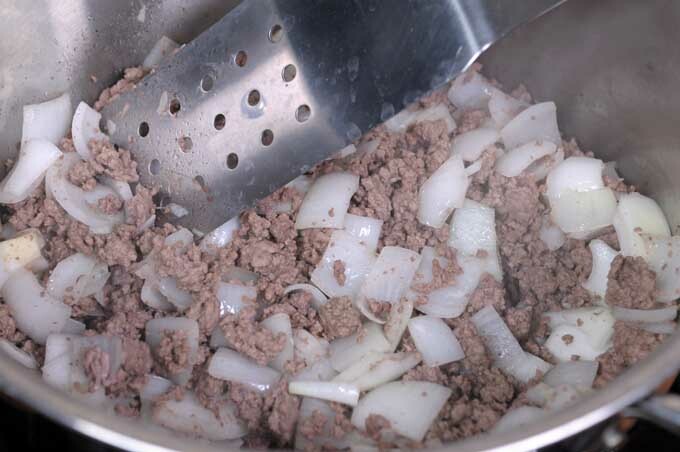 Once your hamburger has browned and most of the excess water from the beef has evaporated away, add your chopped onions and saute at a medium heat until they are translucent. 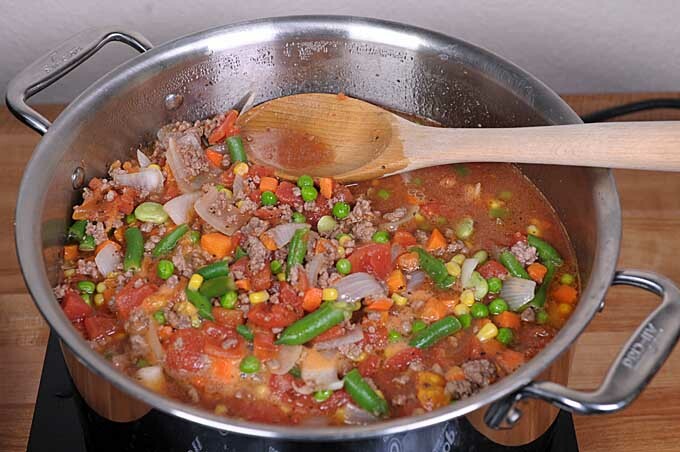 Add your crushed tomatoes, spices, carton of beef stock, and two bags of mixed veggies. Stir, and add salt to taste. I much prefer to use store bought or homemade stock rather than bouillon cubes or powder, since boullion is mostly salt and MSG. This soup/stew is tasty enough on its own, without the added flavor enhancement of MSG. Bring to a boil and then reduce to a simmer. Simmer for at least 20 minutes, but even more time is preferable to better mix and enhance the flavors. As with just about any soup, this recipe is very flexible. 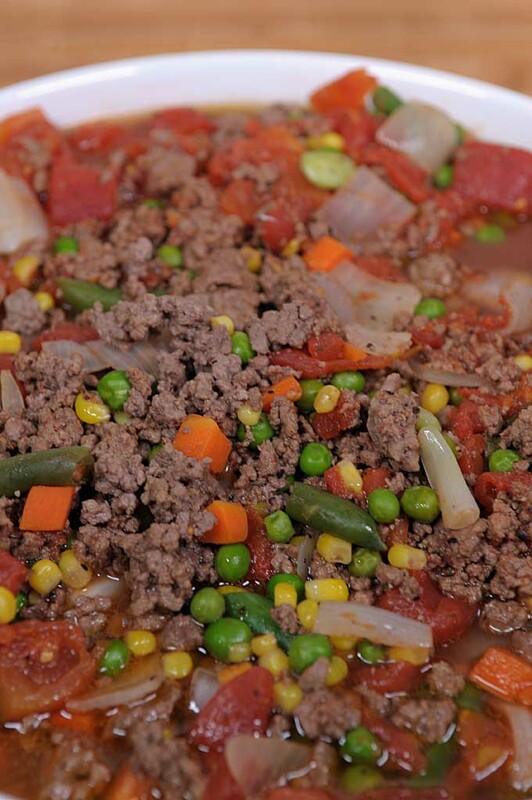 You can substitute ground turkey, chicken, or pork for the ground beef. Like pasta or barley in your soup? Throw some in and simmer until it’s tender. Also, adding in other spices (in moderation) will only enhance the flavor. 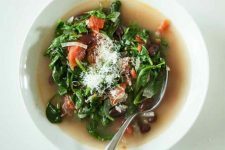 I often add basil and oregano when I make this soup. Chili powder, tarragon, and turmeric are also tasty options. The quantities above will easily feed a family of eight and provide some leftovers. If you have a real army to feed, double the recipe. If you’re a single person or a couple, the quantities above will easily provide lunch and dinner for the better part of a week. I’ll often make a batch of soup on the weekend and have leftovers all week long. 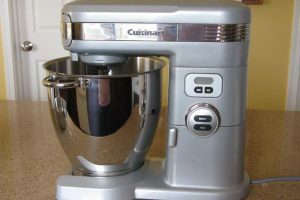 Like make-ahead meals? Grab some plastic containers and freeze half a batch. 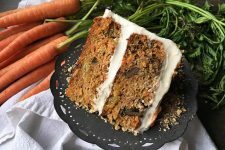 I hope this recipe serves as a helpful way to keep both your wallet and your stomach full this winter! 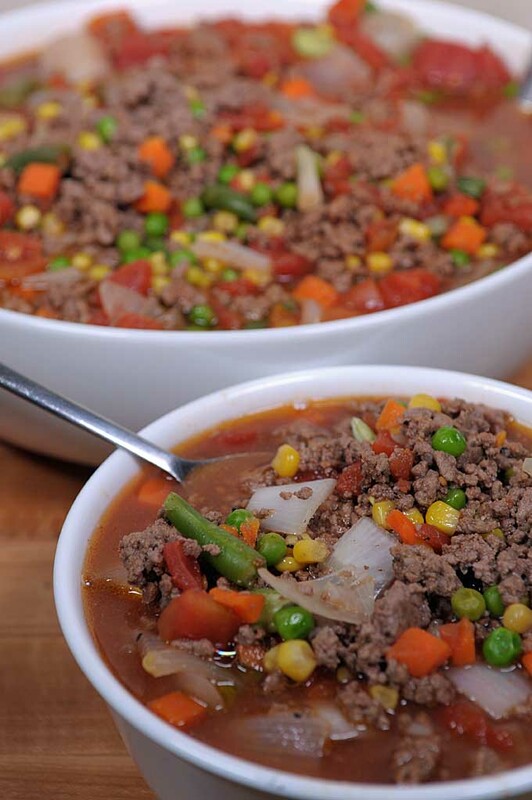 And make sure to check out all of our super tasty soup and stew recipes. Photos by Mike Quinn © Foodal / Ask the Experts, LLC. ALL RIGHTS RESERVED. See our TOS for more details. Originally published February 6th, 2015 by Sandy Weismann. Revised and significantly updated December 17th, 2017 by Mike Quinn. I thought hamburger soup was a new one on me unti I read the ingredients. It’s much the same as what we would call beef and vegetable soup here in the UK. 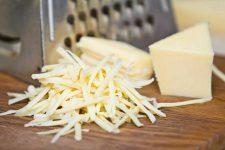 I would second the idea of draining the fat off the ground beef – it’s amazing how much it can produce and draining it off is a great way to reduce the fat content of your food. 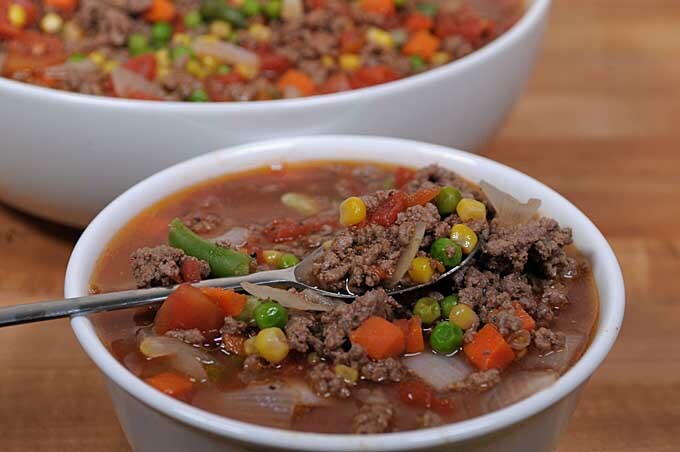 I have never used ground beef to make soup, I always use a cut of beef to make my version, this looks so good I will have to give it a try. I make something similar. Hamburger Stew. I don’t add the tomato puree, but do add either beef stock, or water and beef billion You could also cut up some potatoes into 1 inch or smaller cubes if you wanted. 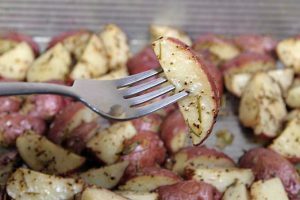 Adding potatoes makes it a bit more filling but you have to boil them for 15-20 minutes before adding the frozen veggies. Then thicken with a corn starch slurry. 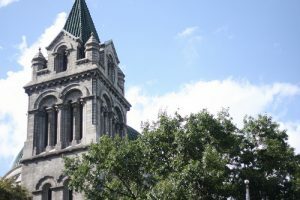 It is so nice and warming on the cold days here, and also filling. I used to make this all the time when I was a broke exchange student in Sweden lol. My favorite thing to do was to use some taco seasoning powder and add some creme fraiche add the end to taste. If I felt like a little crunch, then I’d put in corn chips as well. Yum yum. It’s definitely a good staple dish to have on the menu when you’re broke, lol. You can make a little or a lot. 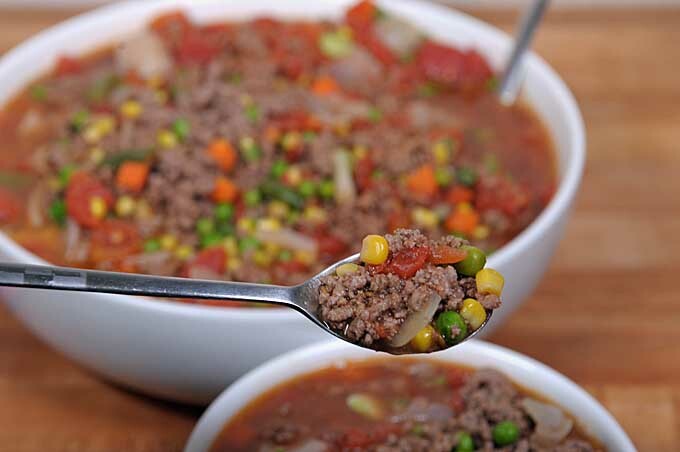 You an use a small amount of ground beef and make it go a lot further. You can even use ground turkey, if that’s cheaper in your area. I also frequently make it with leftovers. 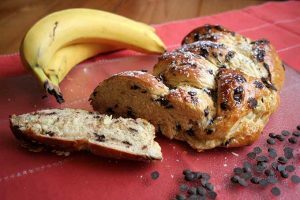 My dad used to make this all the time (rest his soul), and sometimes he’d bring me a jar of it along with a homemade loaf of bread. Yum! This is crazy. My two favorite foods mixed into one! My mother always cooked something like this. She used corn beef instead of ground beef however, but I never noticed the difference. 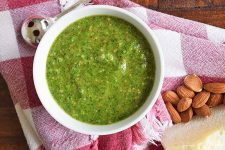 This recipe also looks fairly healthy, so I’ll have to give it a try! Keywords and pictures usually do it for me. This time I got caught by ‘hamburger’. I’m from way across the globe, thus ‘hamburger’ soup piqued my interest. I love my hamburgers, but never really thought of them being made into soup. Anyhow, as I’m not much of a cook yet. I think this is something I can make for myself. In fact, I think I’ve tried making one before, except that I didn’t use pureed tomato. Similar ingredients minus the tomatoes. I do variations of this when I’m cooking for the family as well. I often switch between ground beef and ground pork. If I’m cooking with the ground pork I always mix in a little liver to add to the flavor. Good one, Sandy. This is a stand by at my house. 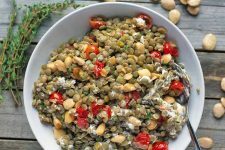 I make it frequently during cold months, and it is a great “pantry meal” (using up what you have). It’s one of those good recipes to use when you are low on supplies. You can use up some leftovers to make it. When I have odds and ends of veggies, I throw them in. Pasta too. 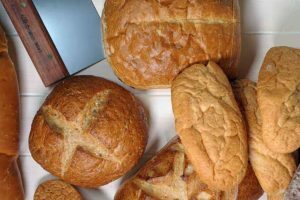 Served with some warm bread, this is good comfort food. This is a new recipe to me. I’ve had beef soup, but never made with hamburger. I will definitely have to try it, it sounds delicious. I like that it’s a fast recipe, since it’s made with frozen vegetables, because sometimes we don’t have all day to make a meal. 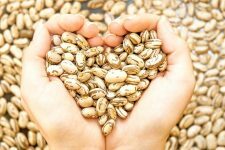 I always keep beans on hand for soups, and barley, as well. Hamburger soup? Who would of thought of that! Not me, that’s for sure. Saying that though, it sounds great and I really want to give it a go. Just seeing these pictures makes my mouth water. 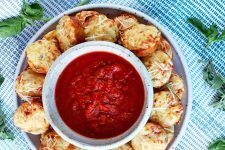 What is really fantastic about Foodal is you always give a fantastic range of recipes, with ideas that even I haven’t heard of. 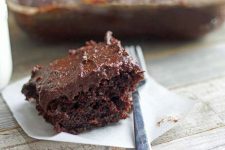 I like that this is a quick and cheap recipe that seems easy to do, as personally I don’t have the ability to slave over a cooker all day long, so quick and easy recipes are perfect for me. This is perfect for me because I always get hamburger and think to myself, what can I make that doesn’t take a lot of ingredients when I’m running low. This is simple. It looks like a balanced meal with healthy vegetables. I’d also love to see a recipe for potato soup. They have one at Olive Garden that is so good and would love to make it at home. in addition to what is listed in the recipe above. I set my slow cooker to low and let it cook for about 8 or 9 hours. I’m pretty sure that the recipe above will work well in a slow cooker, so I am going to have to try it. Making something like this on the stove is problematic for me as I often forget the time when I am writing on my computer, so it is easier for me to throw everything into a slow cooker when my husband goes to work; that way I can just set it and forget it until he comes home. 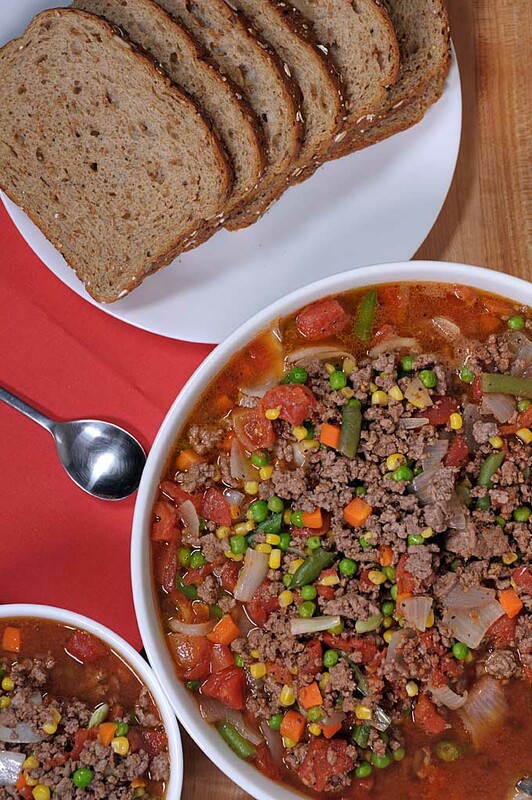 And if you like the hamburger version of this soup, you might also like the ground turkey version. That’s what I usually use as it’s delicious and adds a bit of a different flavor to the mix. I think it would be awesome to try ground sausage as well since there is so much versatility to this dish. You could pretty much put any kind of meat in there and spice it accordingly to create a wonderful vegetable soup. When I first read the title of this article, I assumed it was about a soup that tasted like a hamburger, which I was questionable on. I’m relieved to see that this is actually a vegetable soup with a meat component! As someone who struggles to eat meals with no meat, this is a great option to add a little protein punch to what I would normally consider a side dish.Gonna give this a try when the weather cools off. This is just perfect! I was just thinking about which kind of soup I should make tomorrow because we have been eating pretty much the same tomato and rice soup lately. It is always nice to give the food you eat some variety! Thanks so much. I’m not a huge soup fan, but I would really enjoy this on a winter evening, served with some grated cheese, and some crusty bread and butter. It is 110 outside where I live, I should not be craving soup at this moment. 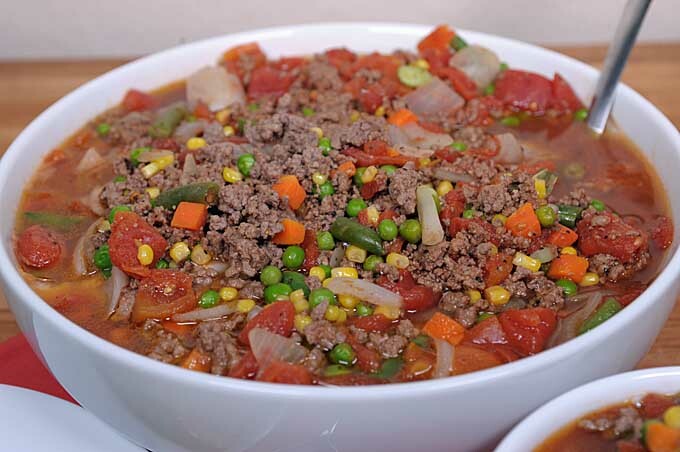 But the photo of this hamburger soup popped up in the corner of my eye and I could not keep myself from clicking. I am a sucker for a good beef and vegetable soup. I always have been since I was a kid. I used to love to slice the green beans in half to expose the baby beans inside and slurp them up in the wonderful broth. Its been ages since I made a good beef soup, mostly because I usually don’t have a lot of beef or roasts in my fridge. What I do have is ground beef. Why did I not think about utilizing it in this way? Sorry family, I know its hot outside, but I think tonight might just be soup night for dinner. This is great. Last week, while grocery shopping, I came across a huge sale on meat. Hamburger was only $1 a pound. This is super cheap, considering its usually $4 a pound. I ended up buying 20 pounds and have been looking for recipes to make, so I can cook this meat up, to go buy more at that price. I will be making a big pot of this tomorrow evening. 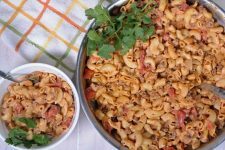 My mom always adds elbow mac to this recipe. The soft, springy mac adds another layer of texture that just makes it better. It’s so tasty on a cold winter day!